The Webster University women’s soccer team is heading to its tenth NCAA Division III tournament after the Gorloks defeated the Principia College (Ill.) Panthers 4-1 in the St. Louis Intercollegiate Athletic Conference (SLIAC) championship. Senior forward Jordan Fosburgh scored two goals and added one assist in the Gorlok victory. Fosburgh said the game was the best she had ever played. “I knew in the back of my mind that if I wanted there to be a difference, I had to be the one to make the difference just like everyone else was thinking in their mind,” Fosburgh said. The Panthers were first to score in the match after midfielder Hayley MacWilliams fired her second goal of the SLIAC playoffs. The Gorloks responded to the Principia goal with just over a minute left in the first half. Freshman forward Lauren Nuelle tied the match with a shot over the head of Principia goalkeeper Murilla King. 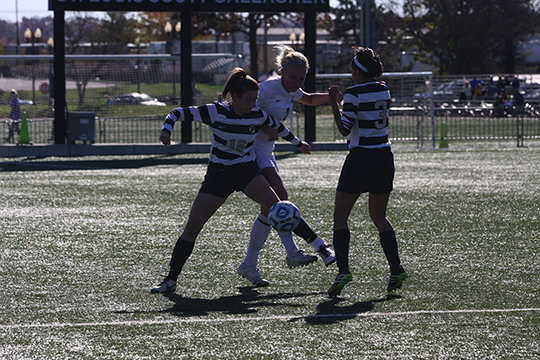 Nuelle’s goal was Webster’s first of four unanswered goals in a 19-minute span. The St. Louis Intercollegiate Athletic Conference named women’s soccer Head Coach Luigi Scire the 2013 Coach of the Year. Scire coached the Gorloks to their winningest season in school history (19 total). The Gorloks finished undefeated in the conference, a feat Webster hasn’t accomplished since 2006. Scire said the team made a couple of halftime adjustments, which resulted in the final three goals in the match. “Once we had a rhythm and once we were able to find those seams behind their defense, then we took advantage with it with our speed and quickness,” Scire said. Fosburgh will participate in her second NCAA tournament on Friday, Nov. 15. Last season, the Gorloks fell to Wheaton College (Ill.) 4-0 in the first-round of the NCAA tournament. Fosburgh said she was nervous, but also excited to play in another NCAA tournament. The Gorloks’ first-round opponent in the NCAA tournament will be determined at 12:30 p.m. on Nov. 11.